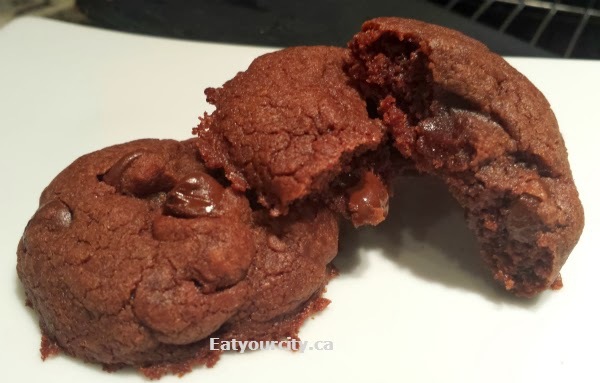 Eat Your City: Nutella cookies - Nutella fudge one bite brownie cookie recipe.. so indulgent and super easy! 5 ingredients, 1 bowl! 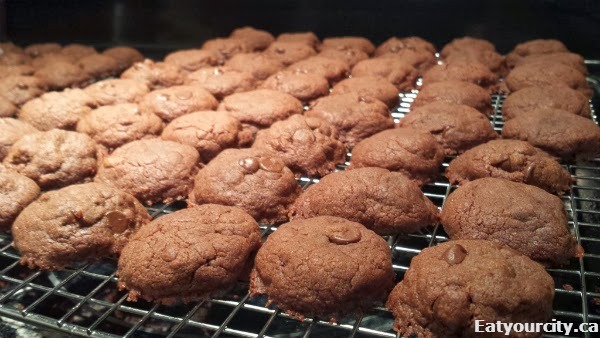 Nutella cookies - Nutella fudge one bite brownie cookie recipe.. so indulgent and super easy! 5 ingredients, 1 bowl! Posted by I love Nutella. It was a special treat when I was a kid as my mom never fell for the "but its healthy and it has hazelnuts and milk in it!" probably as most astute moms realized that if it tasted like chocolate hazelnut icing, it probably wasn't as "healthy" as it claimed to be. So from the odd tastes from my aunt's house (she always stocked it!) and traded sandwiches at lunch.. we fast forward to now... where my boyfriend gleefully discovered they made it in a 5kg jar... and now I'm divided between being ecstatic and asking myself how the heck are two people supposed to finish a jar bigger than our heads of this stuff in a few mere months? This stuff is rich, chocolatey and super sweet awesome, but there's only so much you can spread on toast (I used waaaaay more than the recommended amount heeheehee! ), add it to smoothies (oh yeah baby! ), or pile it atop fruit or crepes... so I decided, why not bake with Nutella? After a bunch of trial and error, we have... the Nutella fudge one bite brownie cookies! If you like a soft almost molten lava cake type centre, eat them while they're still warm with molten centres. If you like them more like brownies, the hardest part is waiting several hours for them to set. Yup, you wait. After they age a bit overnight, they get a wonderful slight chewy brownie texture. 1.Mix egg, vanilla extra and Nutella in a large bowl until its all mixed in. Add flour and mix until dough comes together and no flour lumps remain. Stir in chocolate chips until evenly mixed into the dough. 2. Make dough balls slightly smaller than a pingpong ball, about 1 inch in diameter. Place into a bowl or cookie sheets and pop them into the fridge for at least 1 hour to firm up. (Max 3 days). a) if you want cookie shaped: a baking sheet with parchment paper or use a silicone baking mat or non-stick cookie sheet (I love the heavy duty Wilton's cookie sheets! ), about 1.5inches apart. 4. Bake for 10-12 minutes. Cookies should be mostly set, but might be slightly still soft in the middle. Let cookies cool on the pan/muffin tin on top of a cooling rack until completely set (~10-15min) before transfering onto a cooling rack to finish cooling or they will fall apart! Enjoy while still slightly warm or after completely cooled. Enjoy!! oh yes, this would make me so many fast friends! Thank you for sharing it with me. I wish I had a batch in front of me now. Thank you for sharing!